The aim of the research was to determine whether and to what extent credits for agriculture, that is credits granted to individual farmers and preferential credit for agriculture, affected the level of net profit of cooperative banks in Poland in 2015–2017. Among others, it was established that credits granted to individual farmers are important for generating net profit for both small, medium and large cooperative banks. However, the values of the regression coefficient for this variable were low, with a slight increasing tendency. 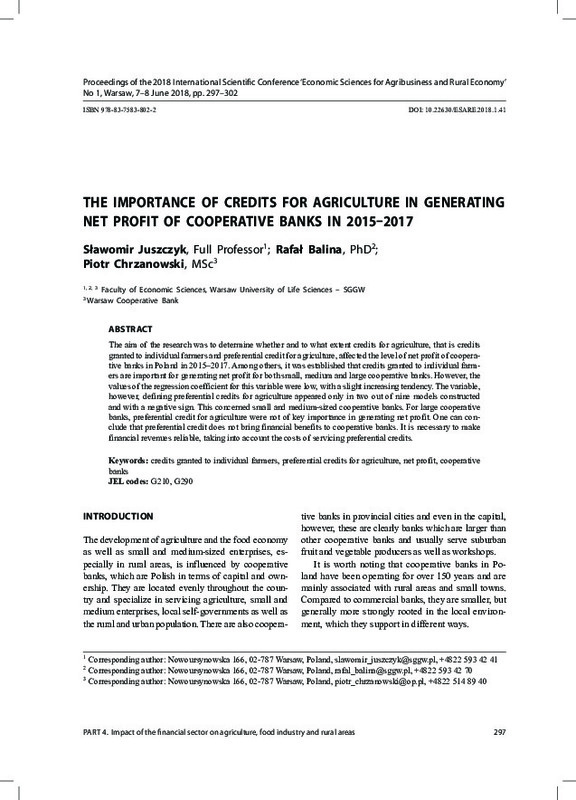 The variable, however, defining preferential credits for agriculture appeared only in two out of nine models constructed and with a negative sign. This concerned small and medium-sized cooperative banks. For large cooperative banks, preferential credit for agriculture were not of key importance in generating net profit. One can conclude that preferential credit does not bring financial benefits to cooperative banks. It is necessary to make financial revenues reliable, taking into account the costs of servicing preferential credits.